UK kicked off the "Kentucky Can: The 21st Century Campaign" Sept. 14. 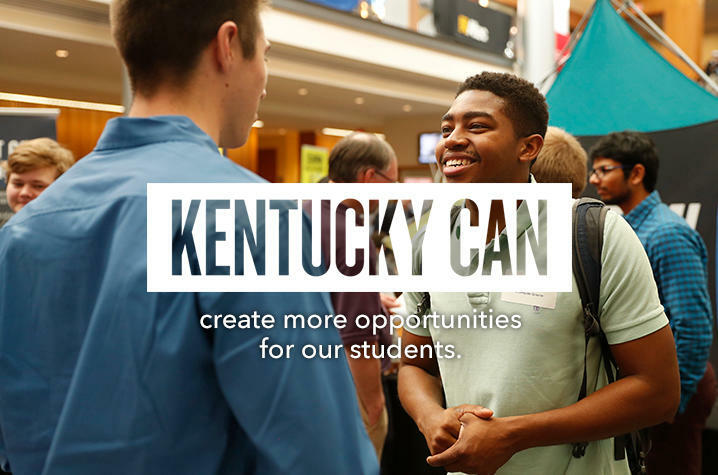 The $2.1 billion campaign – “Kentucky Can: The 21st Century Campaign” – was announced Friday night at a special event attended by hundreds of friends of the university at the Bill Gatton Student Center. “We were founded for the people of Kentucky,” said UK President Eli Capilouto in announcing the campaign. “This place has been – and continues to be – home to pioneers and providers, bold dreamers and strategic thinkers, who make our vision and work possible. Now, we have the opportunity, with a sense of dogged determination and boundless compassion and generosity, to write the next chapter for this university and for those we serve in the Commonwealth and beyond. Funding 2,100 UK LEADS and other scholarships to ensure that more Kentuckians have access to a UK education and that they can graduate on time with reduced debt. The highly successful UK LEADS program is a nationally heralded initiative to eliminate financial need as an impediment to attending and graduating from the university. Endowing efforts – particularly between and among academic and research disciplines – that focus on solving the state’s most pressing challenges. Kentucky, for example, is among the nation’s leaders in opioid overdoses and deaths as well as many cancers, heart disease and diabetes. Growing the university’s endowment from about $1.5 billion to $2.1 billion in gifts, future commitments and investments, as part of an effort to fund recruitment and retention of leading scholars and continue to support development programs and initiatives that provide a foundation for the work of faculty, staff and students. "I was here as a graduate student, only able to earn a Ph.D. because of financial assistance, born in Kentucky, first generation to attend university. My graduate degree transformed my life and opened a world of possibilities," said Gail Hoyt, a professor of economics in UK's Gatton College of Business and Economics. "Now, I am here, starting my 24th year as a professor, giving back because I am thankful, enjoying the privilege of teaching 500 incoming freshmen every fall, tens of thousands of bright minds over the decades. I am here because the needs of Kentucky's students speak to me, and I teach them to use economics to improve their lives and their communities." A fact sheet below provides more detail about funding goals among focus areas, as well as quotes from key campaign leaders. 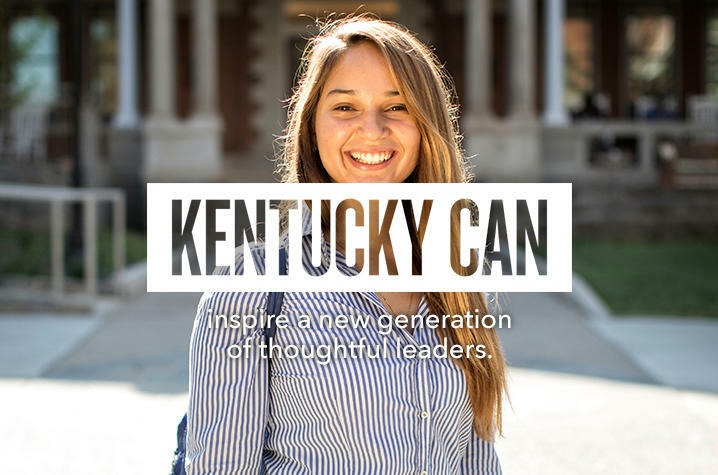 For more information about “Kentucky Can: The 21st Century Campaign,” go to: www.uky.edu. Provide 2,100 LEADS and other scholarships. Grow the scholarship endowment by $300 million. Make college more affordable for Kentucky residents. Increase the six-year graduation rate to 70 percent. Create solutions to the issues we face: cancer, diabetes, obesity, cardiovascular diseases and substance abuse. Assemble more research teams focused on improving Kentuckians’ overall health. Raise $95 million to complete a research facility focused on health disparities in Kentucky. Grow our endowment to $2.1 billion, currently at $1.5 billion. Increase scholarships, offering an affordable education to more UK students. Create a sustainable path for funding programs for the life of the university. Equip our facilities with the latest technology, better preparing students for their lives and careers. Provide 350 scholarships for our student-athletes. Commit to each student-athlete and their academic and athletic success. Ensure state-of-the-art facilities for 22 teams. Fully modernize Memorial Coliseum, home to our great tradition of excellence and our heritage in honor of Kentucky veterans and several of our teams. Create enhanced academic facilities and general scholarships. Sherri Bullard, community leader: "Kentucky is facing unprecedented challenges. The success of this University is linked to the success of the community and the Commonwealth … We feel it’s time to step forward and encourage everyone to step up." Jed Bullard, chairman of Kentucky-based E.D. Bullard Co., international manufacturer of personal protective equipment: "The University helps create the positive community we must never take for granted … For our business to compete globally, this aspirational environment is critical. It’s time to come together to support UK, because it’s not just good business, it’s the right thing to do." F. Joseph Halcomb III, M.D., physician, engineer and entrepreneur: "I believe in God’s master plan in our lives, how each person we encounter leaves a mark – and we are more because of it. My purpose is to leave that positive mark on others." Jim Hardymon, retired CEO of Textron and former chair of the UK Board of Trustees: "I feel I have been overly lucky and should give back … I’ve seen the difference (UK) makes. We are seeing greater retention and graduation rates of students. The University is in a period of positive momentum. Let’s keep it going." Mark F. Newman, M.D., UK executive vice president for health affairs: "This is an opportunity to address some of the critical health care issues that Kentuckians face. 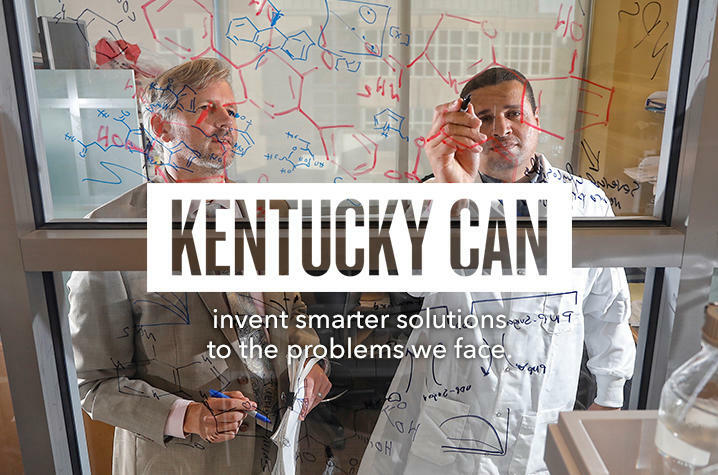 By bolstering our clinical initiatives, ground-breaking research and by educating the next generation of scientists and patient care providers, Kentucky can make a significant difference in the well-being of our citizens, now and in the future. Working together throughout our academic medical campus to engage and collaborate with the health profession colleges gives us a unique advantage in fighting, preventing and overcoming some of our greatest health challenges."